In the course of developing Android apps in Android Studio it will be necessary to compile and run an application multiple times. An Android application may be tested by installing and running it either on a physical device or in an Android Virtual Device (AVD) emulator environment. Before an AVD can be used, it must first be created and configured to match the specifications of a particular device model. 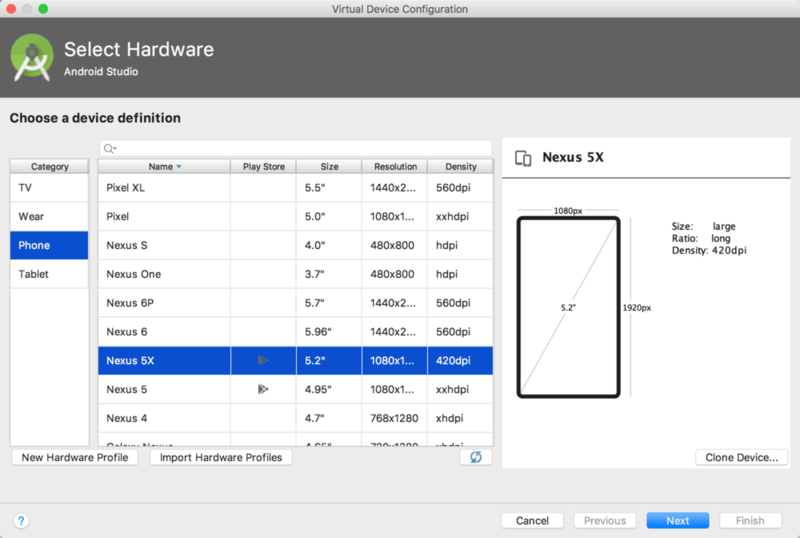 The goal of this chapter, therefore, is to work through the steps involved in creating such a virtual device using the Nexus 5X phone as a reference example. AVDs are essentially emulators that allow Android applications to be tested without the necessity to install the application on a physical Android based device. An AVD﻿ may be configured to emulate a variety of hardware features including options such as screen size, memory capacity and the presence or otherwise of features such as a camera, GPS navigation support or an accelerometer. 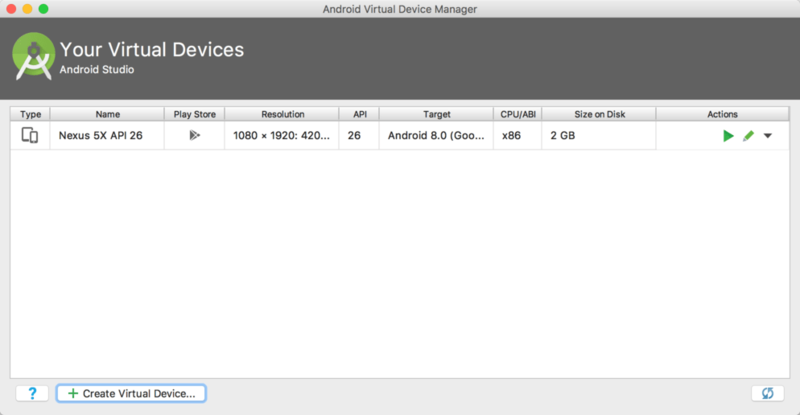 As part of the standard Android Studio installation, a number of emulator templates are installed allowing AVDs to be configured for a range of different devices. Additional templates may be loaded or custom configurations created to match any physical Android device by specifying properties such as processor type, memory capacity and the size and pixel density of the screen. Check the online developer documentation for your device to find out if emulator definitions are available for download and installation into the AVD environment. When launched, an AVD will appear as a window containing an emulated Android device environment. Figure 4-1, for example, shows an AVD session configured to emulate the Google Nexus 5X model. New AVDs are created and managed using the Android Virtual Device Manager﻿, which may be used either in command-line mode or with a more user-friendly graphical user interface. 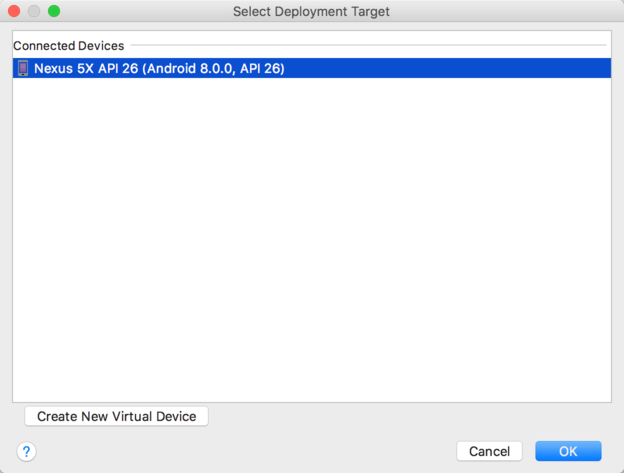 In order to test the behavior of an application in the absence of a physical device, it will be necessary to create an AVD for a specific Android device configuration. To create a new AVD﻿, the first step is to launch the AVD Manager. 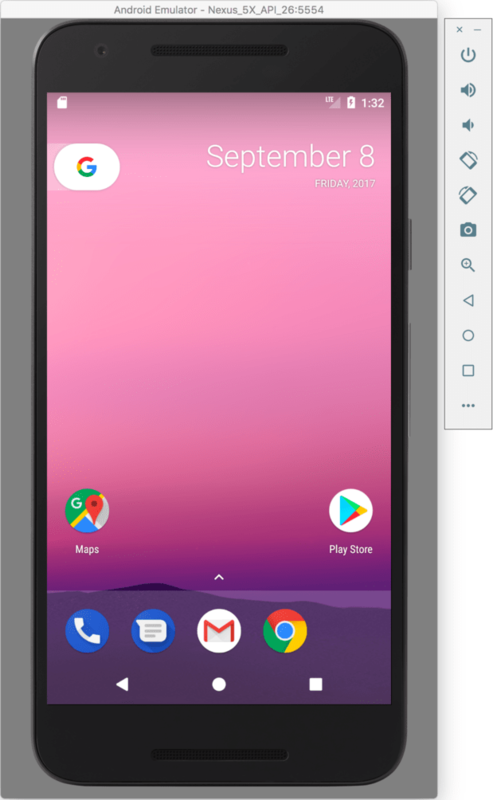 This can be achieved from within the Android Studio environment by selecting the Tools -> Android -> AVD Manager menu option from within the main window. From the Category panel, select the Phone option to display the list of available Android tablet AVD templates. Select the Nexus 5X device option and click Next. On the System Image screen, select the latest version of Android (at time of writing this is API level 28, Android 9.0 with Google Play) for the x86 ABI. Note that if the system image has not yet been installed a Download link will be provided next to the Release Name. Click this link to download and install the system image before selecting it. If the image you need is not listed, click on the x86 images and Other images tabs to view alternative lists. 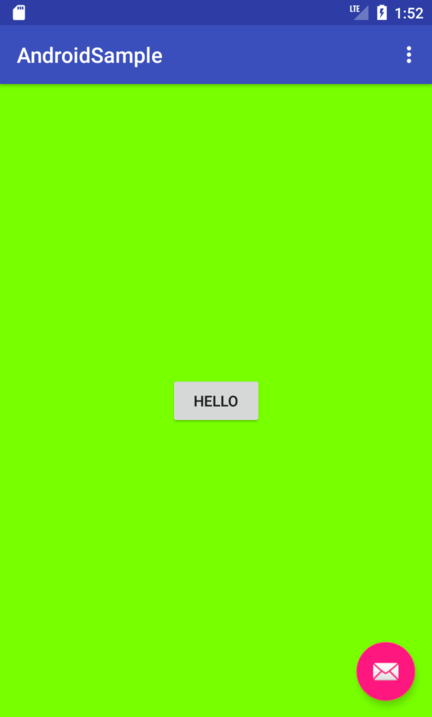 Click Next to proceed and enter a descriptive name (for example Nexus 5X API 28) into the name field or simply accept the default name. Click Finish to create the AVD. With the AVD created, the AVD Manager may now be closed. If future modifications to the AVD are necessary, simply re-open the AVD Manager, select the AVD from the list and click on the pencil icon in the Actions column of the device row in the AVD Manager. To perform a test run of the newly created AVD emulator, simply select the emulator from the AVD Manager and click on the launch button (the green triangle in the Actions column). The emulator will appear in a new window and begin the startup process. The amount of time it takes for the emulator to start will depend on the configuration of both the AVD and the system on which it is running. Although the emulator probably defaulted to appearing in portrait orientation, this and other default options can be changed. Within the AVD Manager, select the new Nexus 5X entry and click on the pencil icon in the Actions column of the device row. In the configuration screen locate the ﻿Startup and orientation section and change the orientation setting. Exit and restart the emulator session to see this change take effect. More details on the emulator are covered in the next chapter (“Using and Configuring the Android Studio AVD Emulator”). To save time in the next section of this chapter, leave the emulator running before proceeding. 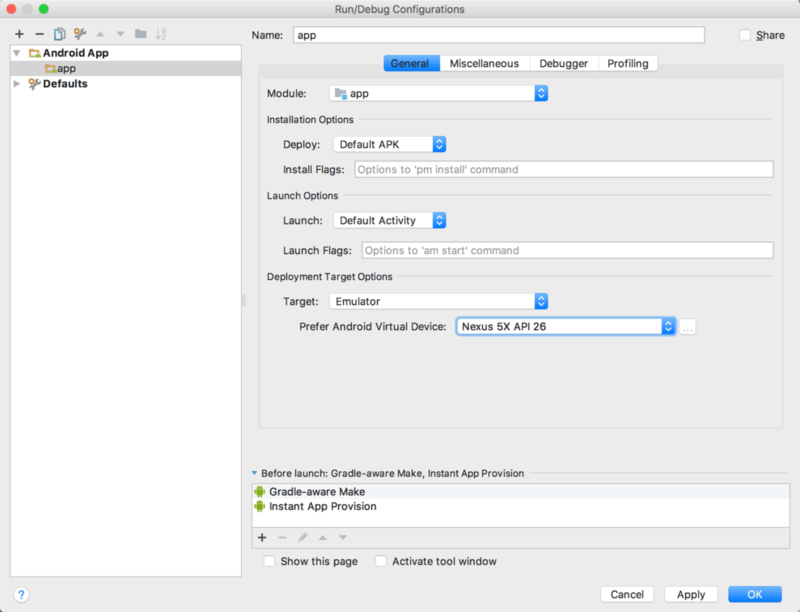 By default, Android Studio will respond to the run request by displaying the Select Deployment Target dialog. This provides the option to execute the application on an AVD instance that is already running, or to launch a new AVD session specifically for this application. Figure 4-5 lists the previously created Nexus 5X AVD as a running device as a result of the steps performed in the preceding section. With this device selected in the dialog, click on OK to install and run the application on the emulat﻿or. If problems are encountered during the launch process, the Run tool window will provide information that will hopefully help to isolate the cause of the problem. Assuming that the application loads into the emulator and runs as expected, we have safely verified that the Android development environment is correctly installed and configured. Be sure to switch the Target menu﻿ setting back to “Open Select Deployment Target Dialog” mode before moving on to the next chapter of the book. With the process selected, stop it by clicking on the red Terminate Application﻿ button in the toolbar to the left of the process list indicated by the arrow in the above figure. As previously discussed, in addition to the graphical user interface it is also possible to create a new AVD directly from the command-line. This is achieved using the avdmanager﻿ tool in conjunction with some command-line options. Once initiated, the tool will prompt for additional information before creating the new AVD. Launch Android Studio and open the AndroidSample project created earlier in the book. Select the File -> Project Structure... menu option. Copy the path contained within the JDK location field of the Project Structure dialog. This represents the location of the JRE bundled with Android Studio. If you expect to use the avdmanager tool frequently, follow the environment variable steps for your operating system outlined in the chapter entitled “Setting up an Android Studio Development Environment” to configure JAVA_HOME on a system-wide basis. avdmanager create avd -n Nexus9 -k "system-images;android-26;google_apis;x86"
The android tool will create the new AVD to the specifications required for a basic Android 8 device, also providing the option to create a custom configuration to match the specification of a specific device if required. Once a new AVD has been created from the command line, it may not show up in the Android Device Manager tool until the Refresh button is clicked. The config.ini file contains the device configuration settings such as display dimensions and memory specified during the AVD creation process. These settings may be changed directly within the configuration file and will be adopted by the AVD when it is next invoked. The <avd name>.ini file contains a reference to the target Android SDK and the path to the AVD files. Note that a change to the image.sysdir value in the config.ini file will also need to be reflected in the target value of this file. Note that the destination directory must not already exist prior to executing the command to move an AVD. A typical application development process follows a cycle of coding, compiling and running in a test environment. Android applications may be tested on either a physical Android device or using an Android Virtual Device (AVD) emulator. AVDs are created and managed using the Android AVD Manager tool which may be used either as a command line tool or using a graphical user interface. When creating an AVD to simulate a specific Android device model it is important that the virtual device be configured with a hardware specification that matches that of the physical device. This page was last modified on 7 January 2019, at 20:34.